Those were eventful days, or rather I heard that they’d been eventful (there was a rash of lynchings in the inland villages and a coup in a neighboring country, cocaine became the world’s number one illicit substance, stagnant water was discovered on Mars, and Pluto definitively lost its status as a planet), my life having shrunk once more to the ambit of books; I had become another specimen of that sad type, the bookseller with literary aspirations. Into this “sad” life, a bit of color appears in the form of a book thief with exquisite taste in literature, an attractive woman (I should have said “colors” earlier in this sentence, since she always sports a different one) who quietly slips into the bookstore, filches books, and mysteriously manages to walk out without setting off the alarm, returning several times. The narrator’s curiosity about her – and her book choices, which “might help solve the mystery of a life that seemed bizarre and fantastic” – trumps any indignation he feels about her transgressions. He allows her petty larcenies to continue long enough for him to let her know that he knows what she’s doing, and for him to fall in love with her. But from the beginning Ana Severina Bruguera (sharp readers may recognize that last name as the same of one of Borges’ publishers) is an enigma difficult to pin down and as chameleon-like as the colors she wears. An unidentifiable accent marks her as perhaps Italian, Honduran, Columbian or from elsewhere. She lives or doesn’t live with an older man who may be her father, husband, lover or grandfather (aptly named Señor Blanco, as though he’s a blank page). She has several false passports on which she appears to travel about, lifting books wherever she goes. Despite the novel’s Guatemalan setting, it possesses a tangible internationalist quality, one made especially appealing here by a suggestion that Severina and her companion seem almost fictions themselves, emissaries from a world of books rather than from a specific, identifiable country. The narrator’s sketchy knowledge about her arrives from multiple sources; hearsay and rumor, the clerk of the pension where Severina stays, Severina’s own cryptic and perhaps mendacious revelations, and even the narrator’s own fantasies, dreams and doubts. Very little is clear in Rey Rosa’s narrative, other than his extraordinarily crisp and lucid writing. It’s unsurprising that Roberto Bolaño thought of Rey Rosa as “the best of [their] generation.” Both writers display an explicit fixation on books and writers to the extent that they become material for their own works, and both incorporate assertions about literature and books that raise questions but remain deliberately inconclusive, the centerpiece at Rey Rosa’s book banquet being a monologue by Señor Blanco (reminiscent of the “bookish pharmacists” passage in Bolaño’s 2666) concerning “the tides and currents of books,” their “migrations, invasions, outbreaks, extinctions.” One might be forgiven for loving this. I’m pleased that Severina, after The African Shore, was the second of Rodrigo Rey Rosa’s novels I read this year. I can’t say I was surprised by Severina’s more circumscribed world of writers and books, a focus with similarities to Bolaño’s The Savage Detectives and almost sure to please fans of that book. But the wider divergence from this focus that is on display in The African Shore – and its meticulous, crystalline-clear writing, captivating storytelling, complexity of themes, unusual atmosphere combining a calm spaciousness with restive, colliding social tensions, and its unforgettable, almost instantly classic contribution to the genre of works in which an animal serves as a nexus for human interactions – reveal manifold different capacities of this writer. I greatly look forward to discovering his other works. I read Severina (2011, English translation by Chris Andrews 2014, Yale University Press) for Spanish Literature Month, hosted by Richard and Stu. The African Shore, 1999, is translated by Jeffrey Gray and also published by Yale University Press (2013). I must say, after reading your review I'm more eager to read this one than the one on the previous post. I love enigmatic women, sporting different colors (could it be as a representation of her background, seeming to be of many cultures?, and above all, the quality of loving books...seeking books...using books to embellish (forge?) one's identity. 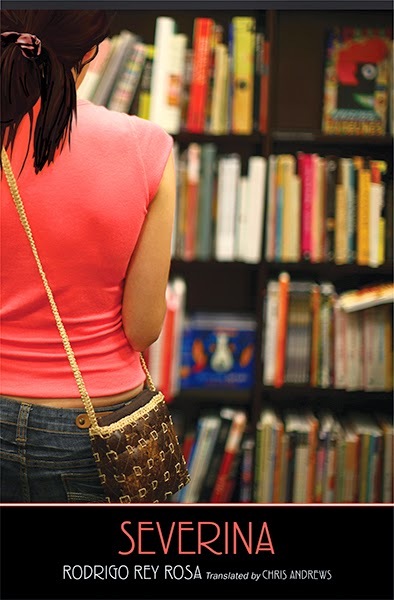 How wonderful that the book seller didn't apprehend her, but came to know her and fall in love with her. I often wonder how it is that my fellow readers choose what books they will read next; it is endlessly interesting to me the different ways that we can go about this. Of course following the trail of a beloved author works, or reading from a specific country of origin works as well. But, reading the books which are mentioned in another book always appeals to me. I want to follow every trail laid before me. One reason Severina is so…entrapping?...is just what you note in your second paragraph, that books mentioned in other books seem to have an irresistible pull. I haven't counted all those mentioned in Severina, but it's surely a few dozen, and even looking into one or two at random allows one to start seeing how they amplify themes in Rey Rosa's book and could lead one down all kinds of rabbit holes. Barnes and Noble has this available for the Nook so you can be sure I'll buy it. Then maybe I can make a document of books listed (like the one you mentioned in Richard's blog about the rats listed in literature). It's a rabbit hole I'd love to fall down. I usually love it when books are full of mentions of books that are connected to themes. This can even get a little pretentious and I still really enjoy the references. I also agree with Bellezza - The enigma that you allude to here is appealing. Yes, that "intertexuality," or whatever the kids are calling it these days, can be great fun. When I see this in store, I'd be very tempted to steal it. hehe. As a title, Steal This Book! was already taken. The only two Rodrigo Rey Rosa novels I've read to date were great but didn't seem anything at all like this description, so I guess it's time I read something else by him. I hear he has a collection of short stories which is also amazing, but Severina sounds pretty awesome. Thanks for the review. I liked this a lot. And as I hope I made clear, I liked The African Shore even more. Another Rey Rosa novella now out in English sounds rather grim, but he's a writer I expect to follow. She does play that femme fatale role, especially, perhaps, in her role with regard to disposing of the body (I'm trying not to give too much away), which could be right of James M. Cain. I'd love to see a film version of this. I'm not sure how a reference to Rolfe's Hadrian the Seventh might get successfully worked in, but the story would still survive a film adaptation (it's equally irresistible to try to make out titles of books people are reading in films, so there are great possibilities here…). Yes, I think a film version could really exploit the visuals here--again not giving away too much. Great review. Funnily enough, I've just read Severina, and I'll be posting my thoughts in a week or so (to tie in with Richard and Stu's Spanish Lit Month). I loved this book, too - a beguiling narrative and Ana is such an elusive and evasive character. I love your comment about there being a noir hidden in here! When I post my review, I'll include a link to yours if that's okay with you? Thanks, Jacqui - I look forward to reading your thoughts about Severina, and yes, of course, linking is fine, thanks. Good stuff - thanks, Scott.